New South Welshman denied of maiden premier class win. Hayden Mellross has accepted responsibility for the 10-second penalty that was handed down to him during yesterday’s sole MX1 encounter of Appin’s Pirelli MX Nationals opener. Mellross crossed the line first during race one, which was the only MX1 moto hosted after event organisers declared racing due to rain-soaked conditions, however an error while being pressured by Todd Waters (DPH Motorsport Husqvarna) saw the Raceline KTM Thor rider make an infringement on the track limits, prompting officials to sanction him. The 10-second penalty was added to Mellross’ overall time, ultimately granting Waters the victory by 1.449s on his return from the MXGP World Championship. 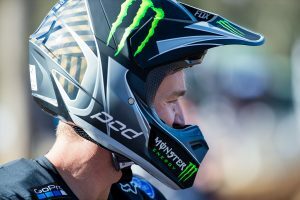 “I’ve actually watched the footage on NRGTV to see where it was,” Mellross told MotoOnline.com.au. “When they handed me the penalty after the race yesterday, I was a little upset and disappointed for my team and myself. “It was one of those racing incidents where there was a guy in my line, we were coming up the inside before the finish line and I drifted to the inside to block myself from getting passed – I just drifted a little too far and ended up on the inside of the turn. I didn’t intend to go that far, but once I turned on the mud I couldn’t go back. “I was in a race situation and I heard Todd in the background, so I accelerated. It was all my wrong doing – if I had of backed off the throttle and rolled through there, I would’ve been alright. I was winning a MX1 moto and I had Todd behind me, so I guess the instinct was to just twist the throttle. 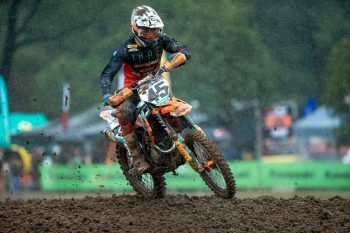 The New South Welshman hasn’t raced the MX Nationals full-time since 2014, with second position at the opening round still marking a strong start to his campaign in the premier category. “It’s definitely a strong start, but it’s obviously not the round we would’ve liked having muddy conditions,” he continued. “I know myself, Gibbs, Clout and Waters, we’ve all been working out butts off and were hoping to have a showdown to see where everyone was at. 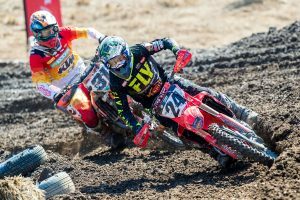 The MX Nationals will now head to Wonthaggi in Victoria for round two of the series, scheduled on 31 March.